Changes in interest rates will disrupt several asset markets. SMSF practitioners should be reviewing their client’s allocations to assets that are interest rate sensitive now. The compression of interest rates, both short and long term rates, following the various global quantitative easing programs has no doubt distorted several asset markets. 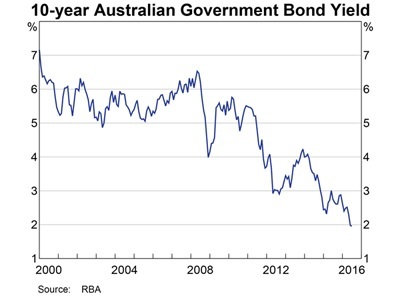 The first chart shows the 10 Year Government Bond rate in Australia which now trades at historic lows. 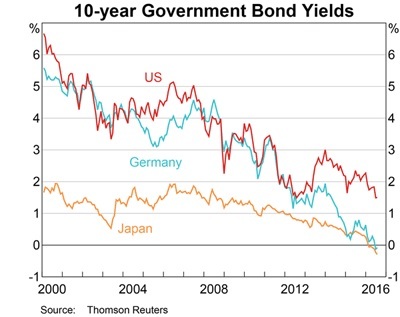 At around 2 per cent, Australia’s long term interest rates are high by global standards as can be seen by the next chart which shows the 10 year bond rate of the US, Germany and Japan. And before checking your glasses, this chart is no optical illusion; the interest rates in Germany and Japan are indeed negative. The Government Bond rates are important as they are considered safe assets, and are normally used as the ‘risk free’ rate of return when valuing other assets. Falling interest rates have provided a tail wind to returns for investors in bonds, property trusts and infrastructure assets. Clearly if long term interest rates rise, the ‘mark to market’ prices of bonds, particularly longer term bonds, fall. By extension, there are several other assets whose price is closely linked to the bond market and are often referred to as ‘bond proxies’. Infrastructure and listed property trusts come to mind and would likely suffer in a rising interest rate environment. While it is impossible to predict when the interest rate cycle will turn, we are concerned that the current market price of ‘bond proxies’ are assuming that interest rates are not just lower for longer, but lower forever. In other words, they would seem to be priced for perfection. 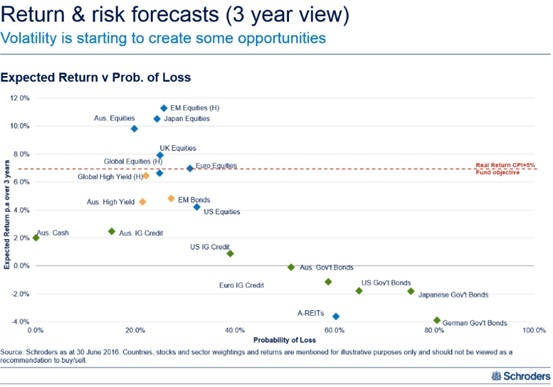 The final chart, sourced from Schroders highlights the distortion that is priced into markets by graphing the expected return of asset classes, versus the probability of loss (X axis). 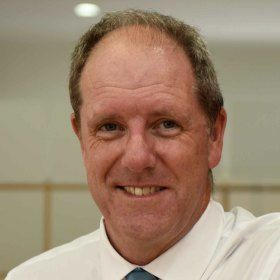 It is difficult to write a script on where SMSF practitioners can help investors make acceptable investment returns over the next few years in the interest rate sensitive sectors such as bonds, property trusts and some infrastructure assets. We recommend that SMSF practitioners review their client’s weightings into interest rate sensitive positions at this time.